Genuine experiential therapy does not consist of occasional student activities. Instead, it consists of deliberately structured clinical, residential, and academic activities. These extend to daily living activities. 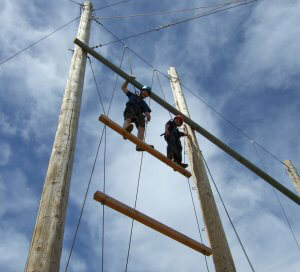 Discovery Academy provides the setting for students to take safe risks they have never experienced before. Those activities may include ropes courses, joining a sports team, dramatic productions, or pursuing newly discovered academic interests. We created a supportive, but challenging environment. Students must leave their comfort zones. As a result, this lets them see their world, and themselves, with new eyes. At Discovery Academy, therapy is not reserved for traditional business hours. A student’s treatment team includes clinicians, teachers, and residential staff. Each group uses their area of influence all day long to extend therapeutic goals. They achieve this through experiential activities, a common language, and relationship development. Our facilities are specifically designed to foster therapeutic interaction, not just in an office, but in every aspect of daily life. Accordingly, Discovery Academy has pioneered the use of “communities” to advance treatment. For example, one community might be four students who share a dorm room, or larger communities such as the classroom, the dorm floor, or the entire Academy. Experiential therapy as a community helps Academy students develop relationships in smaller groups, extending to the larger school as a whole. These communities imitate the way families themselves function. They help Academy students see the balance between self and community, and successfully practice problem solving and team building. Community emphasis helps students see how they are progressing as a group and where they may need to make changes or adjustments. It fosters communication between staff and students, further strengthening the relationship model. For more information, fill out our Assessment or contact our admissions department at (801) 701-3711.